Marshall Cavendish | Paperback & Board Book Formats — What do you get when you dunk a dirty kid in a bathtub full of clean water? Kid Tea! 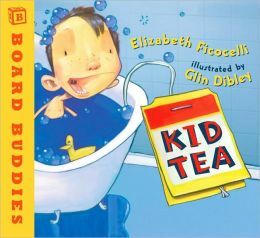 This whimsical picture book follows children each day of the week as they encounter all kinds of colorful calamities, and make “kid tea” of corresponding colors in their bathtub afterwards. (Except, of course, on Sunday, when for a brief time they remain squeaky clean.) Teaches the concepts of days of the week and colors in a fun, lyrical way — it’s a laugh a bath! This is Elizabeth’s first secular children’s book. I stumbled across this book at the library when my daughter was about four. She absolutely loved it so I bought a copy. She’s now eight, but since then, I have read it to hundreds of children when I substitute teach for kinder, first, & second graders. They ask me to read it over and over and can’t get enough! I love seeing the joy on their faces when they chant along “Dunk me in the tub, please, for ……. kid tea.” This book has made me a “rock star” sub at my children’s school. There’s something truly magical about it for young children. Our favorite kid book….We love this book! You will love this book! I have 4 1/2 year old twins and they cannot get enough. It is also a great resource for teaching them the “color” and “days of the week” sight words. Inspired! Go get it now! Bath time has never been such fun! My three-year-old daughter LOVES this book! We have read it so many times that she has it memorized and can ‘read’ it to me. Bath time is now a blast in our house because each time she takes a ‘tubby’ she makes her own “kid tea” by adding different bath fizzies to create different colors. Depending on the color of the water, she will recite the appropriate poem for the day of the week and color from the book. This book is an outstanding tool to reinforce colors, spark an increased interest in bathing and teach the days of the week. I highly recommend it to all parents of toddlers and preschoolers. I now give a copy of this book, along with a container of colored bath tablets, as birthday gifts to all of my daughters’ young friends! My 2-year-old LOVES this book! After having it checked out of the library for two straight months, I finally caved in and bought it. The rhyming text is so much fun, and lends itself to your child ‘filling in the blanks’ as you read. We also love the color and days of the week review the book provides. Very vibrant and adorable illustrations make this book irresistible. Now we guess what color kid tea we will get at bath time each night! Our teacher, Mrs. May, just read us Kid Tea. We love it ! We think it is true. We are going to write other Kid Tea possibilities. We hope you write another funny book like Kid Tea.